Prior to my salvation, someone had told me that something happens when God saves you. I really didn’t understand what this meant. I had this idea in the back of my mind that something spectacular should happen at the moment I prayed. I was worried that I wouldn’t have this ‘experience.’ That was one of the things that held me back. I kept putting the Holy Spirit off, even though I knew that I needed salvation, and I longed for peace. When I couldn’t resist any longer, and I finally repented of my sins, asking Jesus to be my Saviour, there were no heavenly voices, and no lightning, but something did indeed happen. When that burden lifted, I felt such peace! As time went on, and I tried my best to be and to do what I thought my Lord required of me, there still seemed to be something missing. It wasn’t until I surrendered my will that I found that close relationship that I had been longing for. But in spite of knowing what I must do to stay in that right relationship with my Lord, I still find myself straying time and again. But no matter how many times I wander off, I always find Jesus waiting for me when I come back to that secret place of prayer. And every time, I marvel at the mercy and grace of my Lord. Years later, I heard a message about the three places we can be as Christians. The first is touching the hem of Jesus’ garment, the second, is walking hand in hand with Jesus, while the third is on his bosom, where there is no doubt or fear. I took those thoughts and combined with my own experience, I soon had another song. I’d been told about how Jesus had died to take my sin. How I longed to know his presence, and have his peace within. But how would I know this gift was mine? What wonders would I see? No angels, no heavenly voices, no lightning flash from above. Just peace and joy unspeakable, immersed in my Saviour’s love! how I longed for sweet communion; to lay across his breast. he sent me wondrous answers to prayer. When I feel my first love fading, there’s just once place to go. So, I run to meet with Jesus; he’s waiting there I know. In my secret place, down on my knees, I seek my Saviour’s face. he shows me awesome mercy and grace! 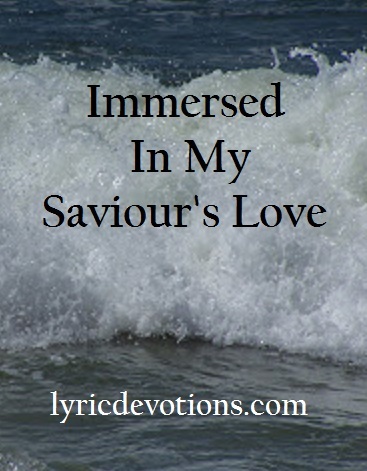 Immersed in my Saviour's love. Psalm 32:7 Thou art my hiding place; thou shalt preserve me from trouble; thou shalt compass me about with songs of deliverance.